Join us on Boxing day, at MIDNIGHT we will be Celebrating Lee's Life, by having cake, drinking 40's & Slurpees and playing Lee's favorite tunes! 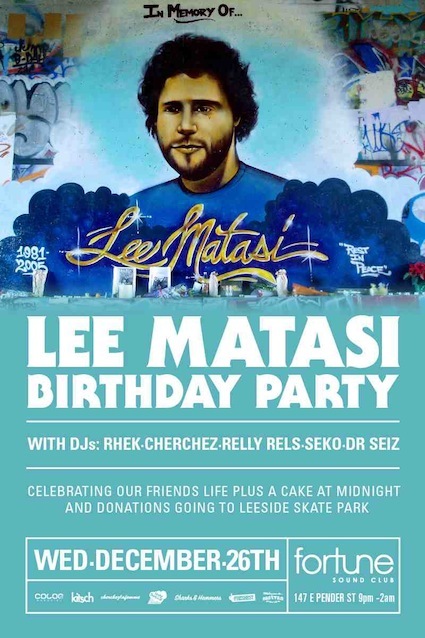 !LEE MATASI BIRTHDAY CELEBRATION AT MIDNIGHT! We decided to have the party on Boxing Day cause its a holiday so allot of people will still be able to party with us! & we can raise more money! + its Lees bday at Midnight! Suggested entry is $5 or more and this is going to Leeside!